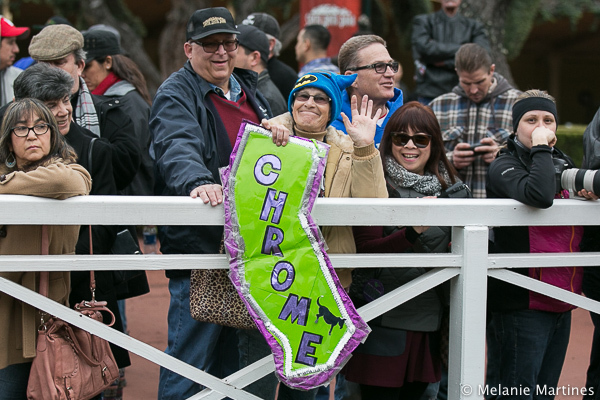 It wasn't just another Saturday at the race track, it was a special day for a "Chromie Fan" like myself! 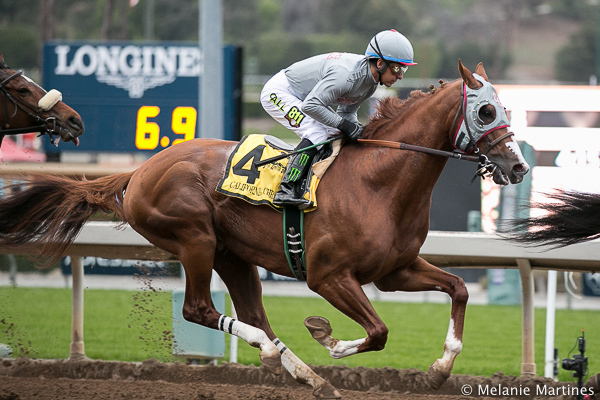 After more than 9 months away from the race track, California Chrome was making his return in the 79th Running of the San Pasqual Stakes. Armed with my cameras, I packed up my car for a road trip to none other than, the Great Race Place! I followed the Weather Channel earlier in the week, and was so happy to see that there was no rain in the forecast for Saturday. Despite cooler temperatures, it still turned out to be a beautiful day of racing! 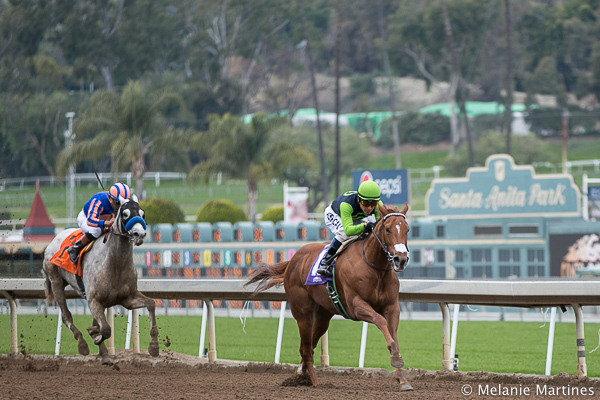 It's always a thrill driving through Arcadia knowing that it leads me right to Santa Anita Park. The very first thought that came to mind was, it's a New Year! So what does this mean? Well to the Racing World, its the start of the 3-year-old season as prep races are under way and races are starting to come together. 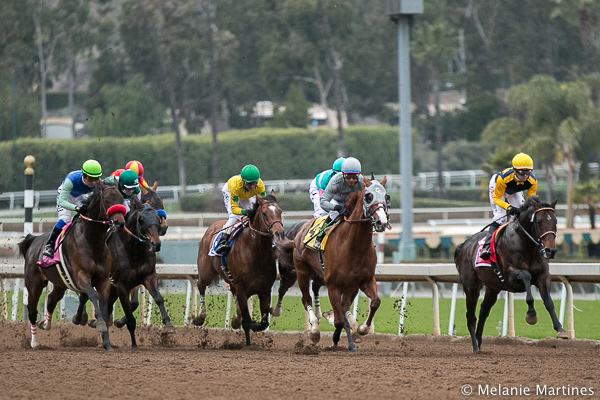 The Sham Stakes was one of the highlighted races of Saturday with a group of interesting 3-year-olds all coming off a route race, which is quite unusual for this time of the year. What 3-year-old would step up to the plate? We'd just have to wait and see! 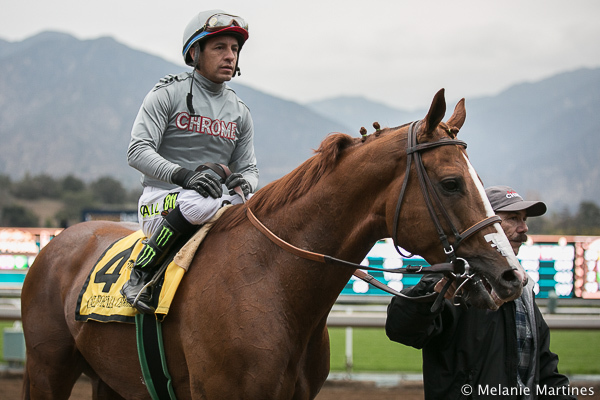 The second thought... California Chrome! This is all I could think about. Idled since March 28 in Dubai, I was very eager to see him. 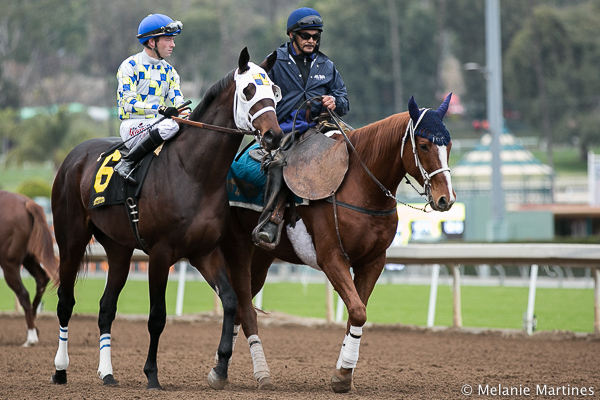 The last time I saw him was last February in the San Antonio Stakes against Shared Belief. 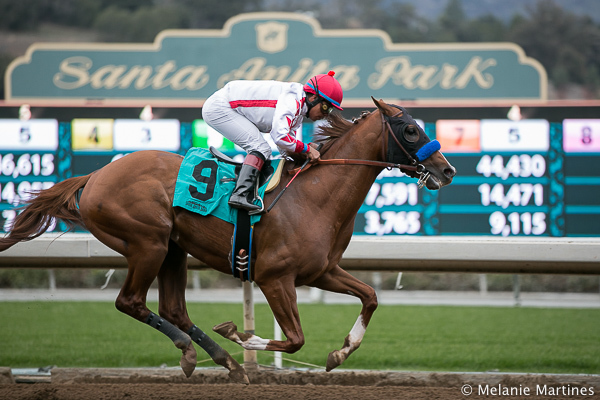 Like many of Chrome's racing fans, I was screaming from the inside knowing I would be seeing him soon and hoping he would flash me his best profile! Finally reaching my destination, it's always a breath of fresh air as I jump out of my car and start walking to the track. The view never gets old with the anticipation of the day ahead and knowing that the Derby Trail has begun to stir the hopes and dreams of every 3-year-old in training. It just couldn't get more invigorating! 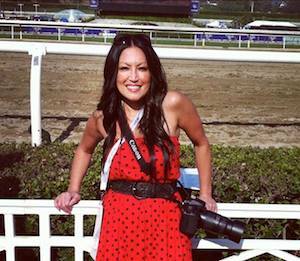 I was off to the races with my Canon in hand! The morning started off with the Vox Populi Giveaway. 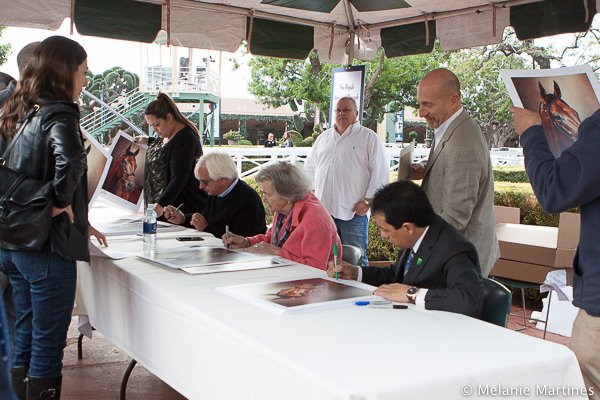 The first 4,000 fans received a beautiful Jamie Corum print of American Pharoah. 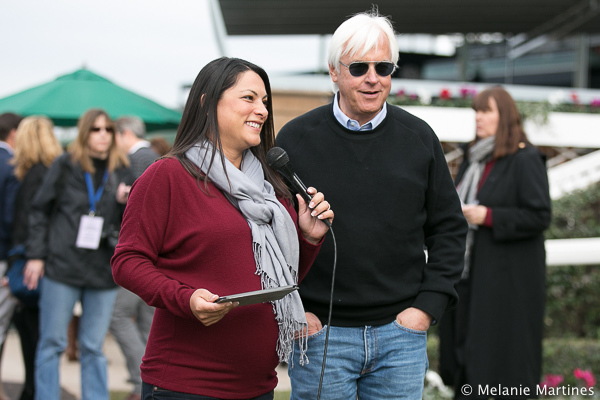 If you were at the track early that morning, you could have have gotten your print signed by the American Pharoah's Trainer Bob Baffert and Jockey Victor Espinoza. The owner and breeder of Triple Crown winner Secretariat, Penny Chenery, also graced us with her presence. By the time I arrived at the gift shop area, the line for autographs wrapped around as far as I could see with fans patiently waiting for their prints to be signed. The day started off great for players taking a chance on long shots. The second race produced $34.40 winner, third race $22.00 winner, and Race 4 which was the start of the $2 Pick 6, produced a whooping $46.20 winner with a colt named Denman's Call. What made the race so sentimental was the winning colt was named after Race Caller, Trevor Denman who recently retired after an incredible 33 years at the Great Race Place. It was the debut race for Denman's Call, a 3-year-old Northern Afleet colt who's 3 ¾-length victory surely killed a lot of Pick 6 tickets! 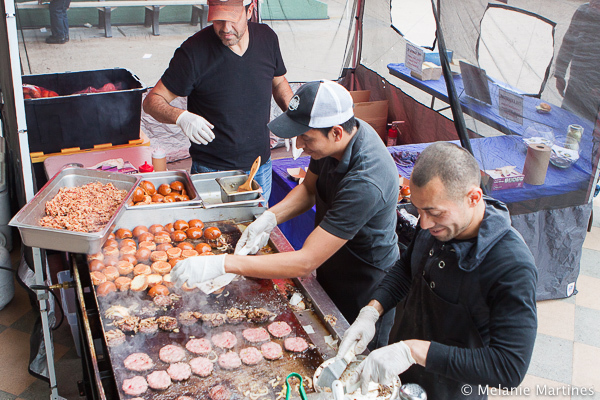 Saturday also was the Burger & Brewfest. 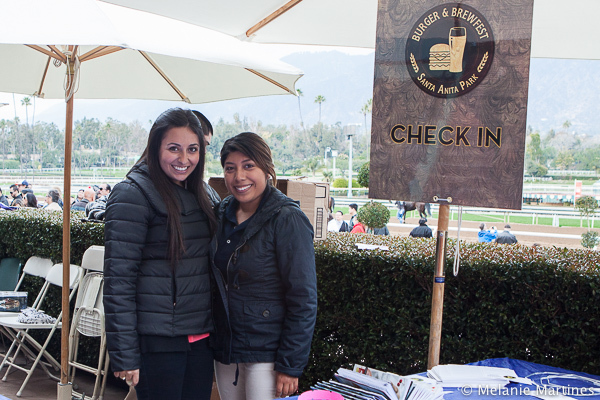 I can't personally think of anything better than Burgers, Beer, and horse racing! Yummy sliders from Rounds Premium Burgers! 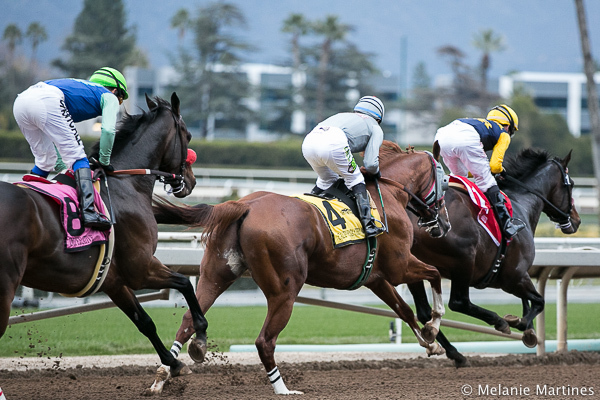 One of the main races of the day was 16th running of the Grade 3 Sham Stakes for 3-year-olds. The winner would receive 10 points toward the Kentucky Derby Leader Board. 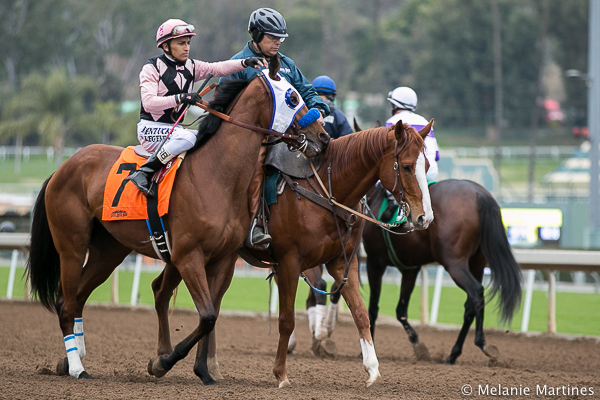 Dressed in Hermes was the second choice morning line favorite, but was unfortunately scratched earlier due to a fever. Here is Collected, a lightly raced colt with only two starts. 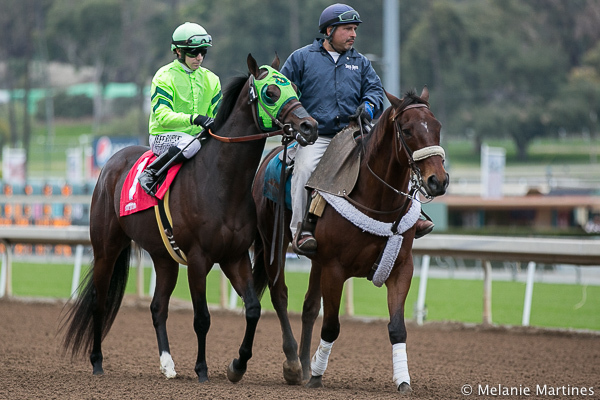 Colt had an excellent turf race at Del Mar last out. By multi-surfaced stallion City Zip, can Collected handle the surface switch to dirt? Here is the field for the Grade 3 Sham Stakes as we journey on the road to the Kentucky Derby. Jockey Joe Talamo and Rare Candy. Main success for this colt has also been on the turf. 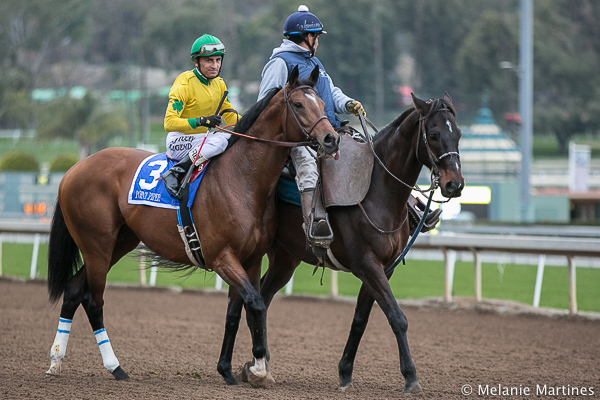 Let's Meet in Rio and Jockey Kent Desormeaux was successful last out while stretching out to a mile. 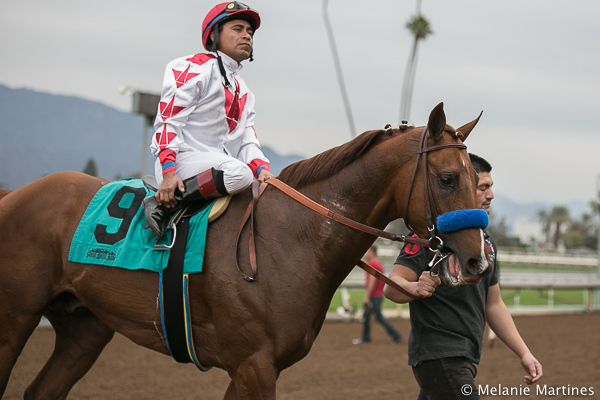 The colt is one of two in the race that Bob Baffert trains. 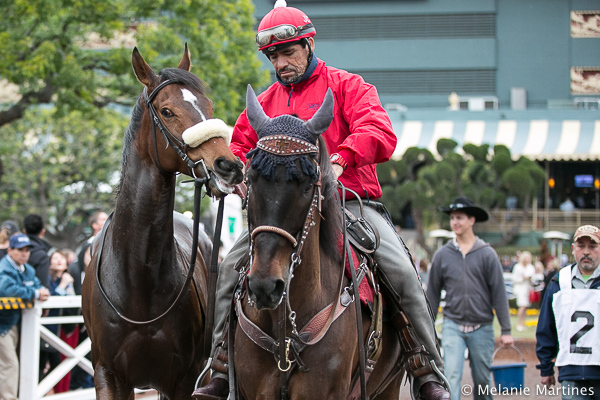 Found Money and Jockey Mario Gutierrez. 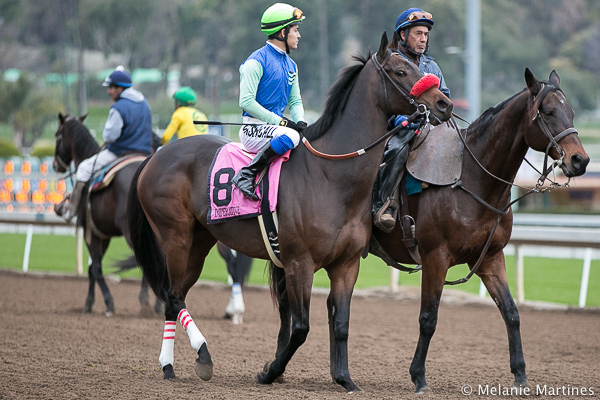 This nice looking colt has been doing well and had won last out in the King Glorious on Dec.12, and moving up to Grade 3 level. Semper Fortis and Jockey Kieren Fallon. Colt is kin to Multiple Grade 1 winner, Carpe Diem. Had won last out, but now moving up in class. 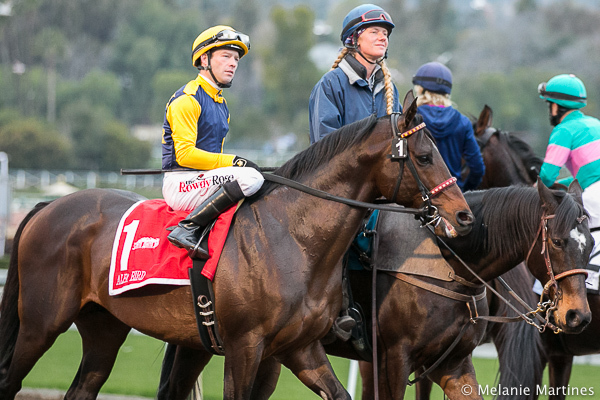 Laoban, son of Uncle Mo with Jockey Tyler Baze on board. Ran second last out and has been working well. I'malreadythere ran third in his last 2 races and now moving down in class to Grade 3 company. 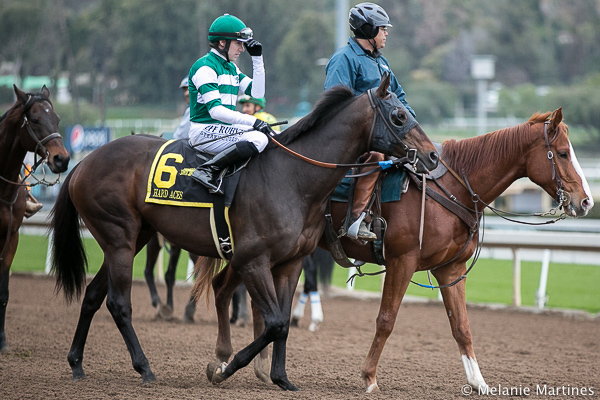 Sorryaboutnothing adding blinkers in race and hoping to get involved, since last race did not look very promising. 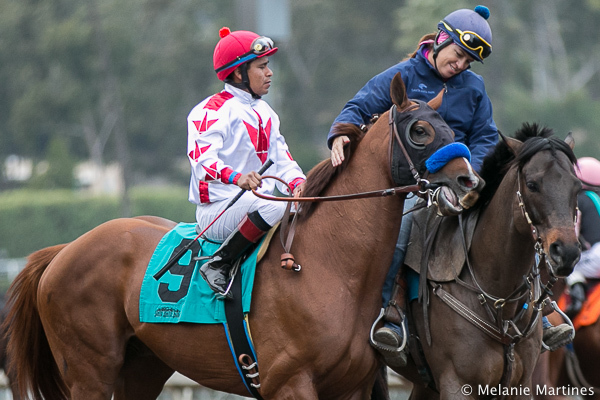 Trainer Bob Baffert's other horse Collected, getting love from pony rider before race. Collected hung four wide deep in the back stretch, but took the lead a quarter mile out, and proved best in the stretch heading for home. Collected made transition to dirt very successfully. 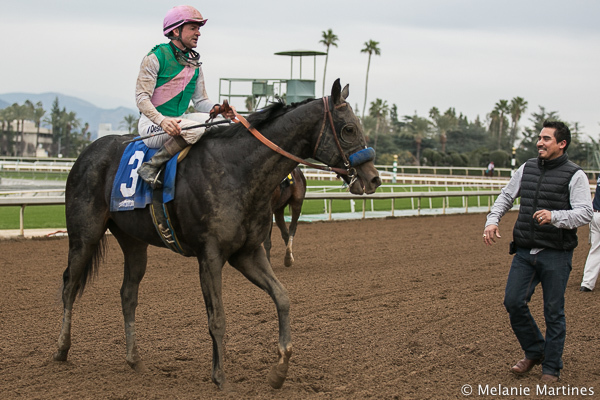 He received a modest 80 Beyer for his effort, which is not too shabby being it's only January and there could definitely be something more. Collecting 10 points on the Kentucky Derby Leader Board is winner Collected. 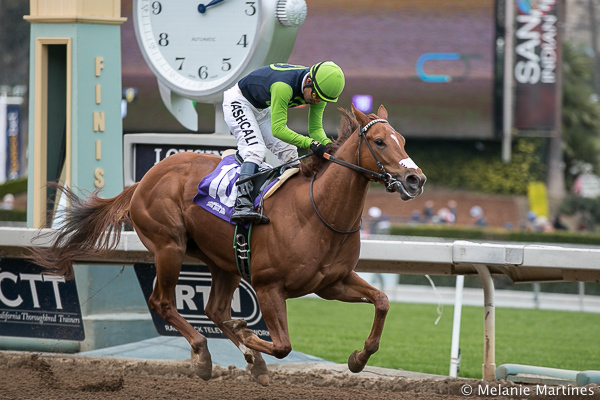 Juddmonte Farms, Let's Meet in Rio ran a gamely second, flying on the outside with an impressive late run coming from last. Trainer Bob Baffert all smiles as both of his 3-year-old trainees, Collected and Let's Meet in Rio take the 1-2 exacta in the Sham. 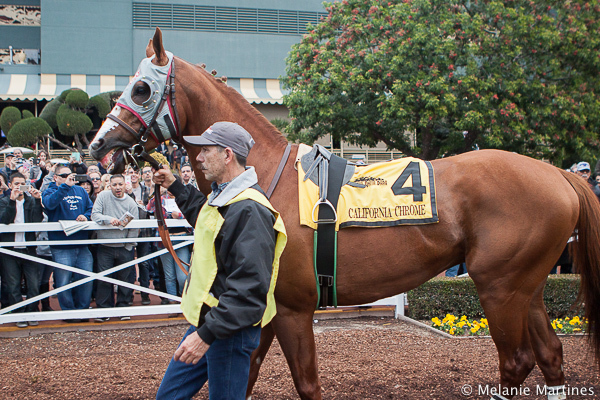 Chromies waiting for California Chrome to arrive in the paddock area. 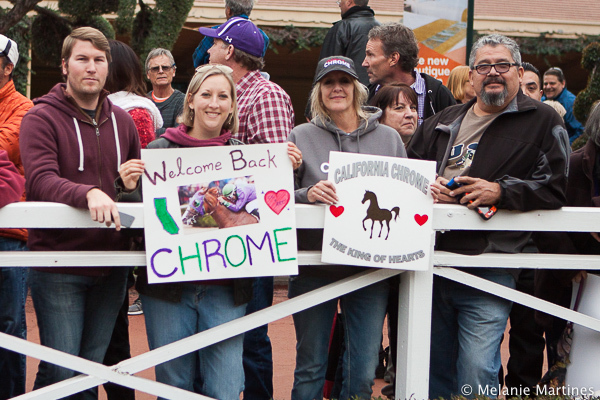 Chrome fans excited to see the champ! Horses from the San Pasqual field arrives to the saddling area. Here is Blingo. A very crowded paddock area as fans greet the horses. 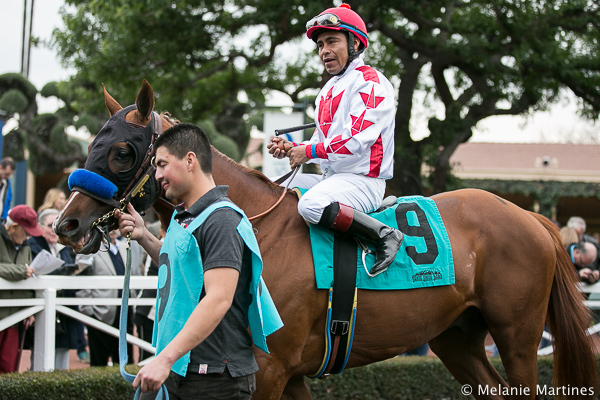 Here is Point Piper and Jockey Rafael Bejarano. 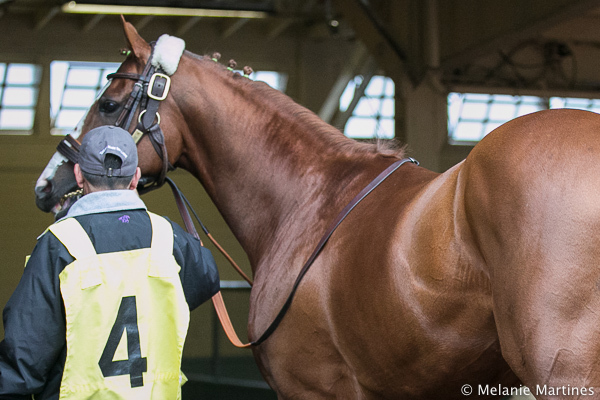 Chrome looking so filled out, sporting his shiny coat. 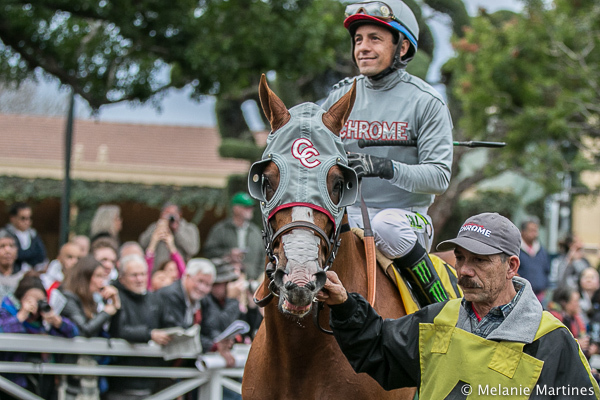 It was so nice to see Chrome back! Racing fans snapping shots of California Chrome as he walks by. 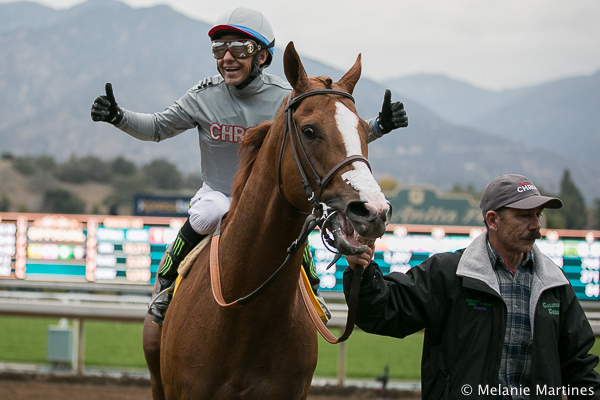 Art Sherman on California Chrome, "It's so heart-warming to see his fans and the reception he received. It was just jammed full of people around the paddock. It was just great." 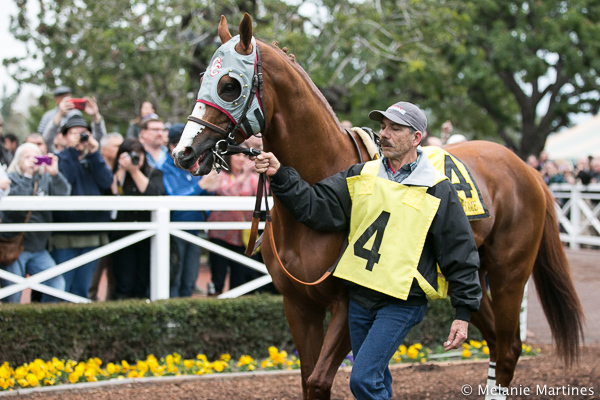 Here is California Chrome about to leave the paddock and headed to the track. 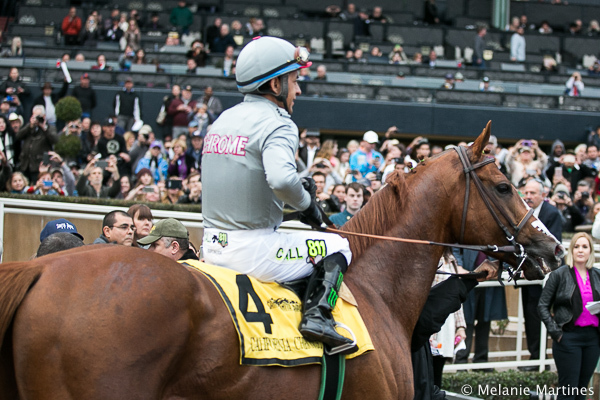 I must say, it was really strange at first seeing Chrome in different silks. I was just so used to the colors of purple and green. 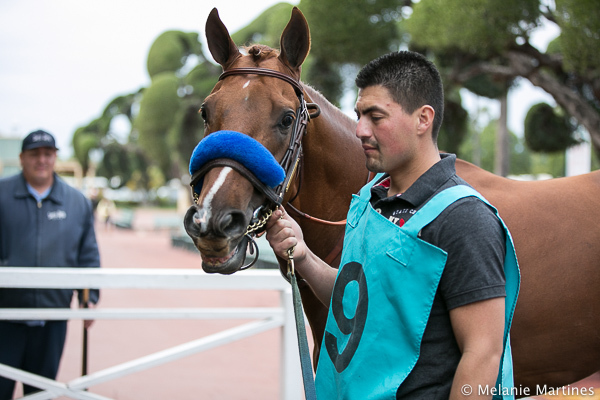 Post parade for the 79th Running of the Grade 2 San Pasqual Stakes. 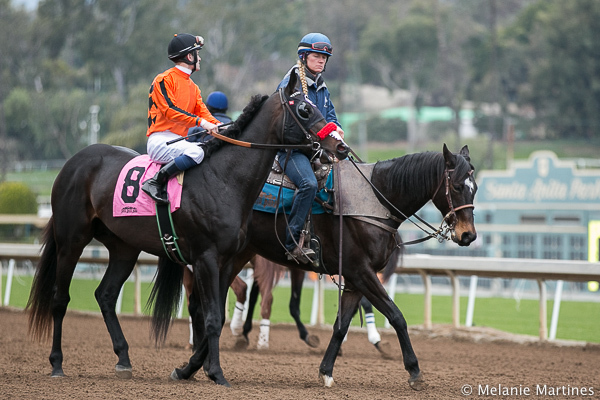 Here is Lucky Charm Stable's Alfa Bird ridden by Tyler Baze is expected to be right up front with the speed. Familiar silks of Blingo, owned by Mr. and Mrs. Moss. 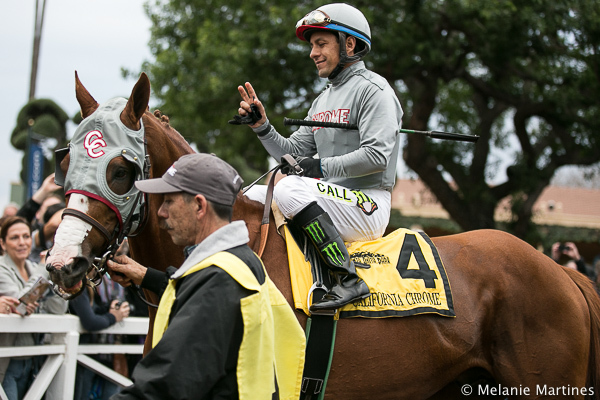 With his running style he should be running late with Jockey Alex Solis. 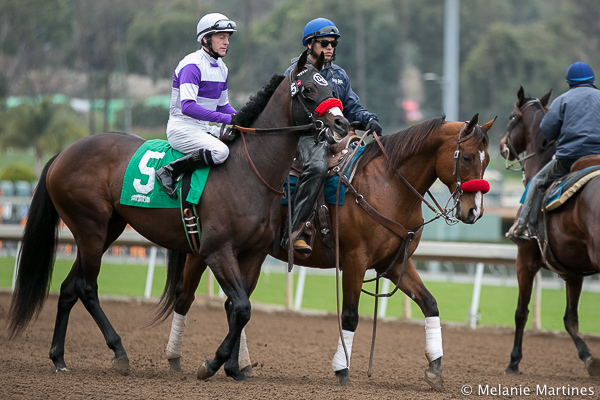 Jockey Rafael Bejarano and Point Piper who had a nice bullet work on Jan. 3rd going 7f. 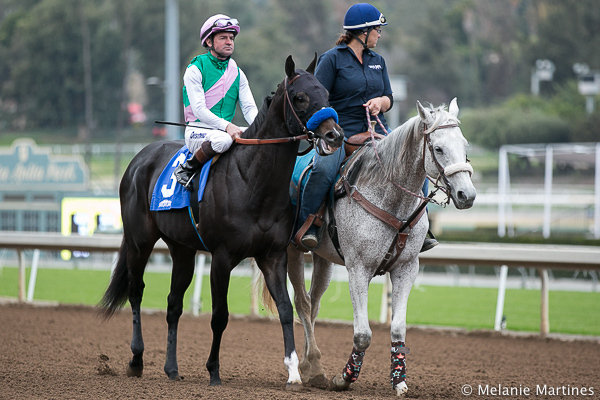 The last time I saw Hard Aces was in the Breeders' Cup Classic on Oct. 31st. 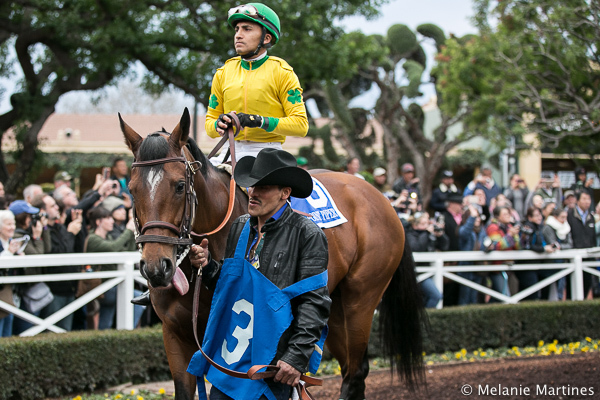 Imperative and Jockey Mario Gutierrez. As expected Alpha Bird goes straight to the front. 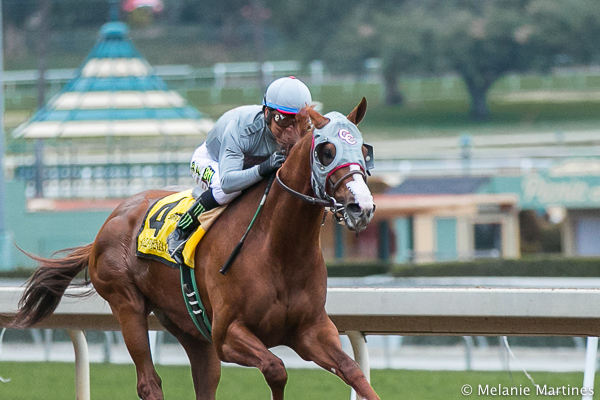 California Chrome setting up shop, and beautifully stalking the pace. 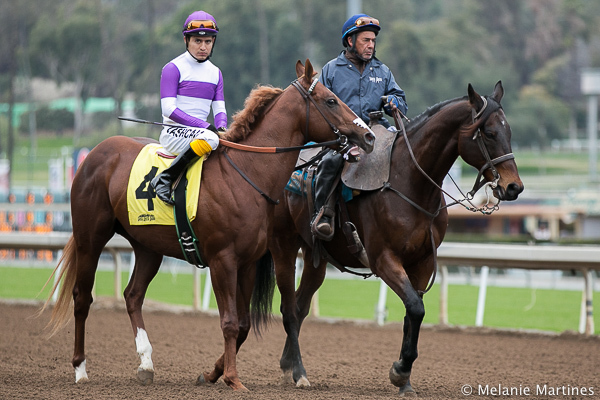 California Chrome sitting nicely behind the moderate pace setter, Alpha Bird. 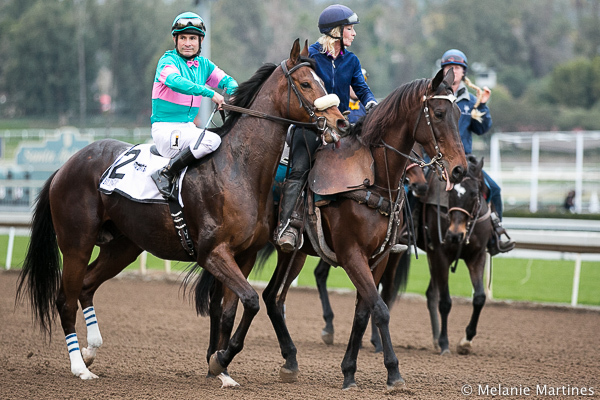 Victor Espinoza, "Today is what I wanted, I didn't want to override him, I didn't want to push him. I wanted a balance." 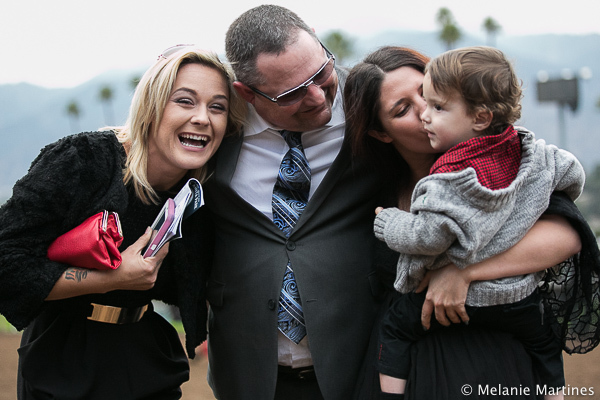 A very happy Alan Sherman with family. Jockey Victor Espinoza having a good time after the race. 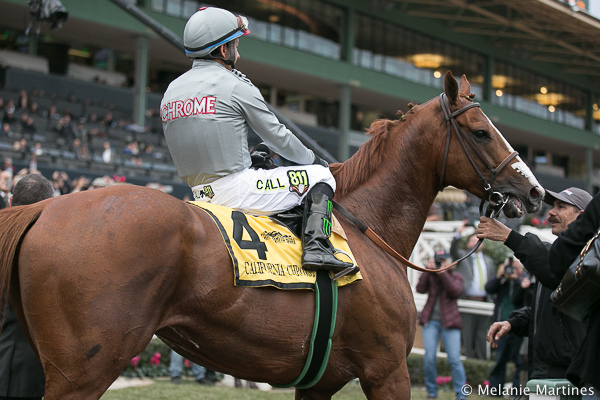 California Chrome is now the wealthiest and winningest Cal-bred in history at $6,442,650 surpassing Tiznow in career record earnings. 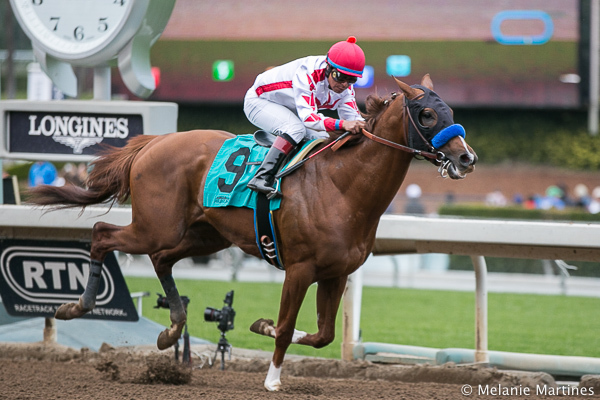 It's such a surreal story and a great accomplishment for the connections of this amazing horse. My final thoughts of Saturday? Where has all the time gone? 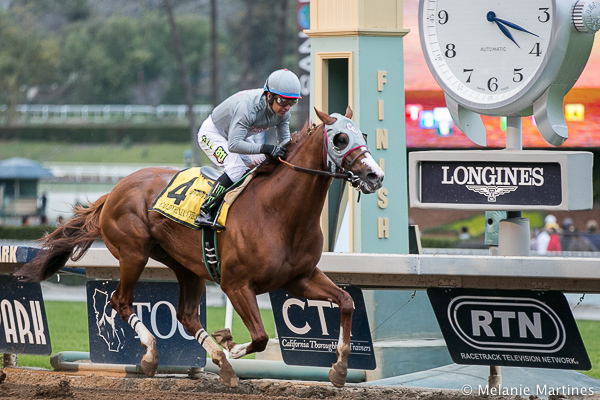 It's so hard to believe that California Chrome is 5-years-old! From a physical stand-point he transformed into a full-fledged older horse. He was a fuller image of his former self, and shined like a new penny. From Dubai to England and back to the states he has circled the globe with more frequent flyer miles than most of us will ever see in our lifetime! The happy ending is that he is finally home with the people who have spent endless hours with him, the Sherman Team and his dedicated Groom Raul Rodrigues. He is back at home at Los Alamitos Race Course enjoying his "suite" as they call it, which is not your average horse stall. His home is now a huge stall, which is really two stalls with the wall knocked down. All for the horse that truly deserves it! 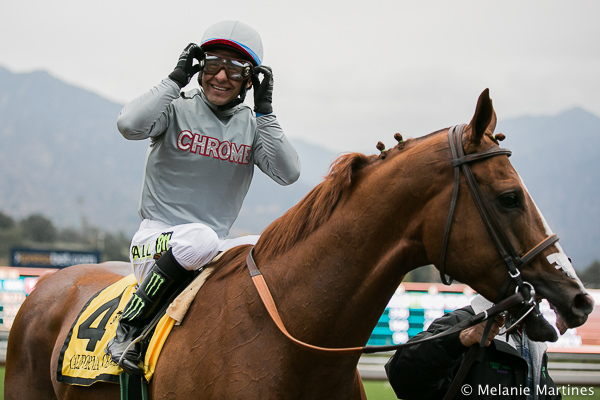 Saturday was just the beginning of a new chapter for the "Chronicles of Chrome". 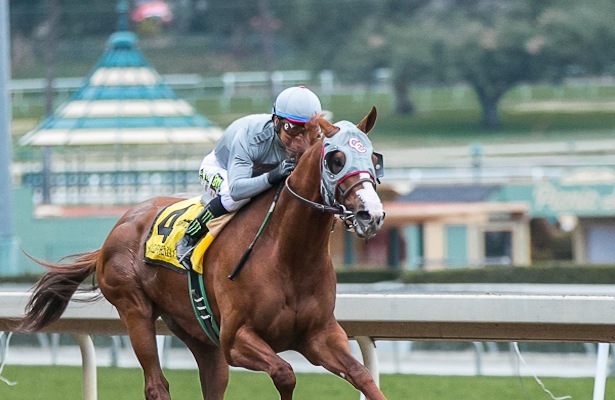 California Chrome leaves the West Coast late next week, and heads back to Dubai with bigger goals in mind which includes the richest race in the world, the Dubai World Cup in which he ran second last year to Price Bishop. Accompanied by Trainer Art Sherman's son Alan Sherman; they'll be shipping a much different horse, one that is physically and mentally mature. The plan will be to ship him out to Dubai, have one prep there, then return home after the World Cup. And so... the Cinderella story continues as fans get to enjoy another year of racing with a horse we have surely missed. PS. 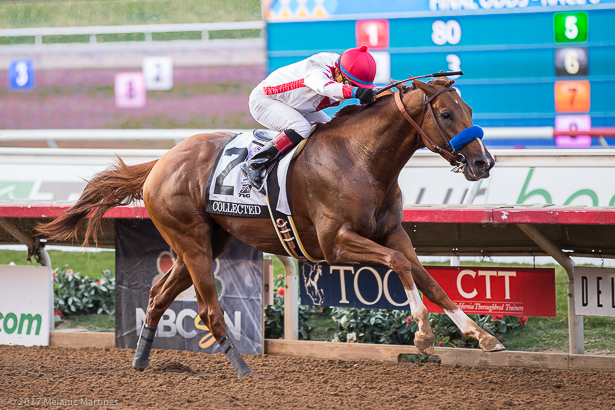 I'll see you in Dubai, Chrome! 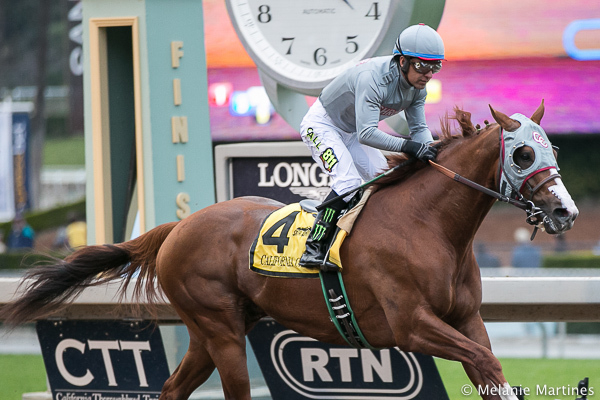 After the races, I gathered all the videos that I had captured through the day and created a tribute of California Chrome and paired it with the "perfect song" by Darius Rucker! Enjoy!